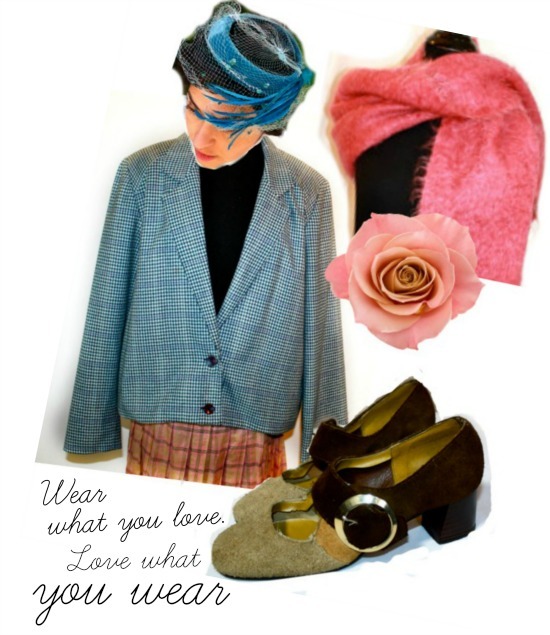 The Art of Dressing for Life: Wear what you love love love, and artfully live. The outfit is perhaps a bit ordinary, nothing that shouts "fashion" or "art", or is particularly remarkable. A couple of plaids, a polka dot, a straw hat and gold shoes, thrown in for good measure. The dress method is very much the technique employed in childhood: throw on only garments that I love, whether or not they match. Some days, you just strike sartorial paydirt, and discover a sweet spot, where everything just works, in a random, round about sort of way. Somehow, the random mixing (and likely the straw derby) brought me to thinking about one of my favorite artists- Magritte, and how he captured the details of the mundane in such a dream-like, beautiful way. These days, my days, are pretty mundane- I've been working at home, and my source of income comes from selling my Fresh Picks online via Ebay and Etsy. The act of listing all day: not very glamorous, so perhaps it's a bit of a treat to doll up and parade in front of the camera! 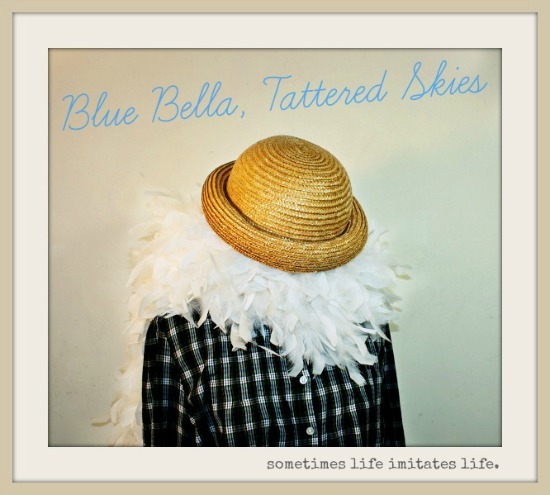 I had fun in a recent photo shoot- and I suppose I've been feeling very Bella, Tattered Skies lately. My go-to uniform lately, usually revolves around a Karina dress. Why? Because the dresses are so comfortable. They pretty much feel as comfy as wearing sweats, but a little (OK- A LOT) better looking. 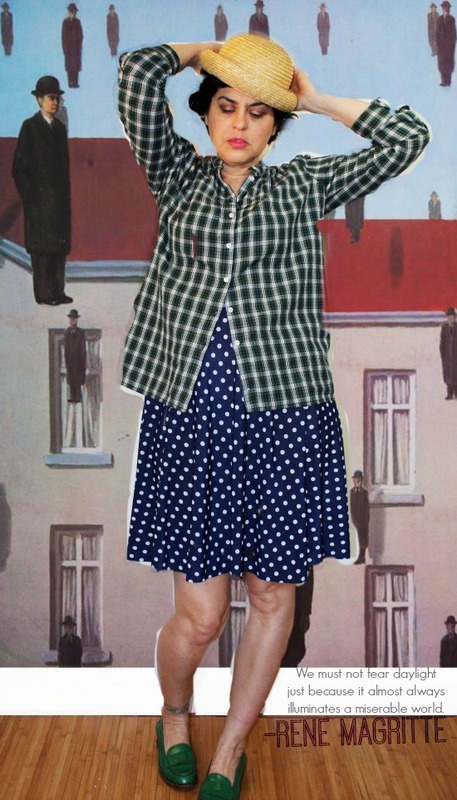 This dress is from the 2014 spring collection, the Nora style in a navy polka dot. The plaid on plaid layers over it, are worn just because it makes me feel happy. The shirt and jacket are from my personal collection, but I'm now listing them for sale. I love the cool, calming effect of wearing blues and greens. vintage teal feather whimsy, vintage Scottish pink mohair shawl, vintage Personality 1960s tri-tone suede shoes, pre-loved Prada skirt (sold), vintage 1970s Koret green and purple houndstooth cropped wool jacket. You are the queen of tartan!!! Love the hat!!! Sometimes I have to remind myself to put on something decent when I know I'm just going to be home listing---very easy to end up working all day in pjs! 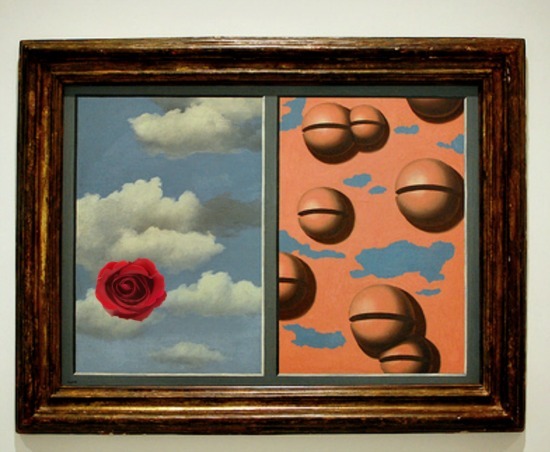 In this post you echo so many of the same things that have been whirling around in my head lately - throwing things on, even Magritte. But your throw-ons always scream Style. 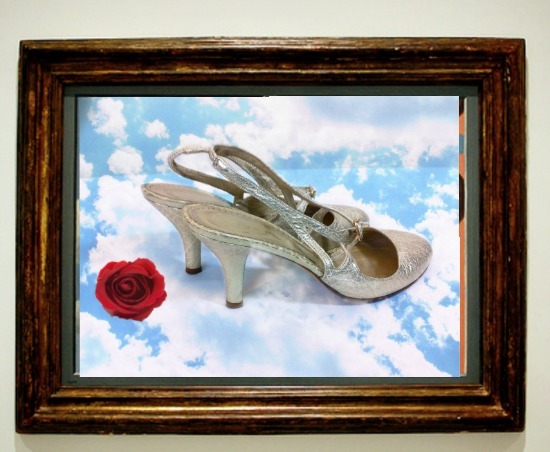 Re-imagining Margritte is a great way to see the world! I love that first photograph. I also love the plaid and polka dot combo, and that sweet hat! hurrah for your Fabulous Plaiditude, and I would like to express properly ho much I love your post á-la-magritte, your awesome pictures and your style!! you're inspiring and cheering up my day!! Even whilst I am sat at home not doing much of anything I always try to wear something that brings a smile to my face. I can never understand people who keep things "for best". Life's to short, wear what you love as often as you can.